Normally, I'd try to start with some clever quip or current event related introduction, but given that I'm already late, I'll skip the formalities and get right into the meat of this tournament. 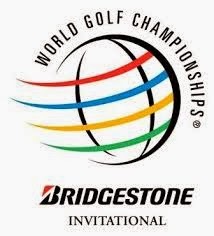 With the Bridgestone, remember that this is a no-cut event. Everyone that starts, unless they withdraw, will finish. While that means you'll score some points for just about everyone, it also means that picking someone who places higher is even more critical than just picking players who won't miss the cut. In this week's edition of the Power Rankings, and those going forward, I'll be listing the Top-15 with their Total Aggregate (TA), a number that combines recent performance with course history and some select other metrics, and the change (CHG) from the last tournament they participated in. Total Aggregate is out of 100, with a lower number indicating a better ranking, as described in Movers and Losers. Graeme McDowell - TA: 14.17, CHG: +3 - The Irishman has a win and three other Top-10s in his last four starts and hasn't finished worse than 28th since a T64 at The Players. While his best career finish here is a mere 22nd, if he plays like he has the last few tournaments, he'll finish considerably better. Adam Scott - TA: 14.42, CHG: +1.8 - The World-Number-One has been playing lights out since being crowned as such. He's got a win, two other Top-5s, and a Top-10 in four starts. I made a last second switch to pull him off my fantasy teams for The Open and quickly regretted that decision. Tied for 4th last year and won here in 2011. Brendon Todd - TA: 14.6, CHG: -6.8 - Todd hasn't ever played the WGC-Bridgestone, but that doesn't mean he doesn't deserve to be considered. His T39 at The Open, like a few others, is his worst finish in some time. In fact, you'd have to go back to a missed cut at the Wells Fargo to find the next closest tournament where he finished outside of the Top-20. Since that missed cut, he's got a win, three Top-5s, a Top-10, and a Top-20. Jim Furyk - TA: 15.58, CHG: 0 - I love seeing Jim Furyk play well, so it heartbreaking for me that he's got three close calls this year but no victories. Personal opinions aside, Furyk has a second place and fourth place finish and two other Top-20s in his last four starts. Pair his current form with a T9 last year and solo-second in 2012, and he's a can't miss start this week. Steve Stricker - TA: 15.58, CHG: +4 - Trucking along as usual, Stricker makes an excellent safety net if you want to start some riskier players in Yahoo! leagues. He's overdue for a strong finish, as his last two finishes came undone as a result of poor final rounds. Placed 13th last year and T2 the year before. Henrik Stenson - TA: 16.33, CHG: -1 - I replaced Adam Scott with Stenson for The Open and he thoroughly let me down. That is not to say that he's been playing terribly, as that T39 at The Open is his worst finish by far in his last five starts. Prior, he three straight Top-5s and a Top-10. He tied for second here last year as part of his hot streak that saw him with the Fed-Ex Cup. Jordan Spieth - TA: 18, CHG: -4.4 - Speith skipped this tournament last year before making his first effort at the PGA Championship. While he missed the cut at last year's PGA, he hasn't slowed down much since. His T36 at The Open is his worst finish since a T37 at the Byron Nelson, but between those low (for him) finishes, he recorded four Top-20s and a Top-10. He's returning to action after a well deserved break, so he'll be fresh this week. Ryan Moore - TA: 19.83, CHG: +17.6 - He probably surprised more than a few with his T12 at The Open. He's already surpassed his best year on TOUR with year, and hasn't shown any sign of letting up with a Top-5 and a Top-10 in the two starts prior. T33 here last year. Hideki Matsuyama - TA: 20.5, CHG: -3.2 - Cooled off some with a T39 at The Open, but with that being his worst finish in seven starts, I'm not terribly concerned. He's frequently passed over for bigger names, so if you're behind in your league, you may be able to snag some otherwise missed points. Placed 21st in his first effort here in 2013. Sergio Garcia - TA: 20.58, CHG: +0.2 - Can you believe that you'd have to go back to January 26th, 2014 to find his most recent win on any tour and to 2012 for his last PGA Tour win? Since January, he's recorded two Top-10s, two 3rd place finishes, and two 2nd place finishes. Those two second place finishes are in his last three starts. Tied for 40th last year and 29th in 2012. Matt Kuchar - TA: 22.25, CHG: +19.2 - Ended a 5 tournament skid without a Top-10 last week with a fourth place finish at the RBC Canadian Open. As is his usual level of consistency, Kuchar has never finished outside the Top-30 in four attempts and has two Top-10s at Firestone CC. Phil Mickelson - TA: 25.67, CHG: +15.4 - His results have slowly been improving since a missed cut at The Players, though he's still without a top 10. To be fair though, he's got two Top-15s, a Top-25, and a Top-30 in his last four starts. Its not so much that he's playing poorly, he just hasn't played exceptionally. Tied for 21st here last year. Keegan Bradley - TA: 26.58, CHG: +3.6 - Seems to show up and play his best at big tournaments. Bradley tied for fourth at The Open and at the U.S. Open. Couple those strong results with a T2 here last year and a victory in 2012, and he could just run away with this one in a year where eight-time-winner Tiger Woods may be a non-factor. Rickie Fowler - TA: 27.58, CHG: +19.6 - When Fowler started this year, I doubt many had thought he'd contend for each of the year's majors, much less place second at the U.S. Open and The Open Championship. In his last four starts, he's got two second place finishes, a Top-10, and a Top-15. Tied for 21st here last year. Rory McIlroy - TA: 28.17, CHG: 0 - I know, I know, the recent Open champion this far down? Chalk it up to a very strong field and some weaker finishes in his starts previous to The Open. Really though, he should be higher on this list, probably in the Top 5, but the numbers don't lie. He finishes T27 here last year, and T5 in 2012.